Facebook never ceases to try out new features. With exciting new features, it constantly tries to retain its customers. Being one of the most popular social media platforms, Facebook has never shied away from taking risks. It introduced the face recognition feature long time back so it’s not a new thing. If you’ve observed closely, you might have seen in the past that whenever you upload a photo on Facebook it automatically recognizes the faces for you and suggests you tag people if they’re present in your friend list. 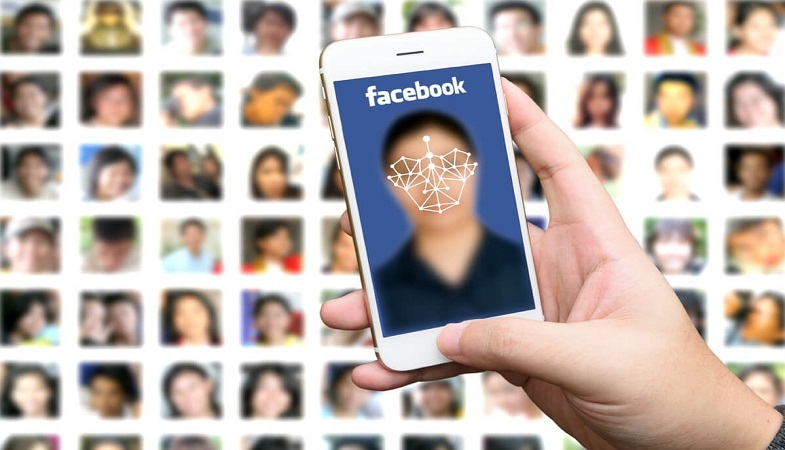 Lately, Facebook has modified its face recognition feature, allowing it to perform more functions. This new advanced feature will now prevent strangers from using your pictures as their profile picture, hence helping you get rid of the fake accounts. On the other hand, it will also alert you of the pictures and videos where you haven’t been tagged by your friends. This feature, basically, uses your profile picture and all the photos and videos that you’re tagged in, to figure out if you are tagged in someone’s photo or video on Facebook. The setting for the face recognition feature has been enabled by default. However, if you do not like the idea of your photos being scanned then you can also turn off this feature. 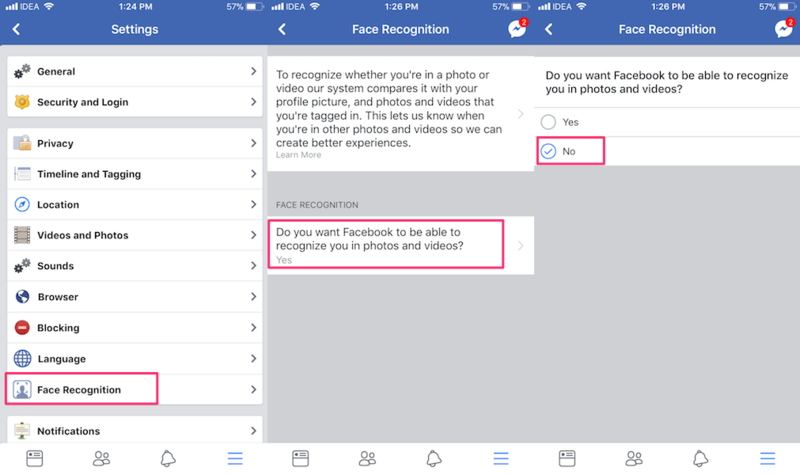 In this post, we will share the steps to disable the face recognition feature on Facebook from the website and the Android and iOS app. The face recognition feature on Facebook can be turned off from both the website and the app. Let’s quickly follow the step-by-step guide to find out how we can disable the feature. Step 1: Visit the Facebook site and log in to your account in case you haven’t already. Step 2: Click the drop-down icon present at the top right corner of the screen and then select Settings. Step 3: Once you’ve reached the Settings page, click the Face Recognition at the left sidebar. Step 4: After that, click the Edit option next to the Face Recognition setting and choose No from the drop-down menu. That’s all. The face recognition feature will be disabled for you on Facebook. Apart from the website, you can also turn off the face recognition feature from the Android and iOS app. Step 1: Head over to your Facebook app and tap the Menu icon (hamburger icon). 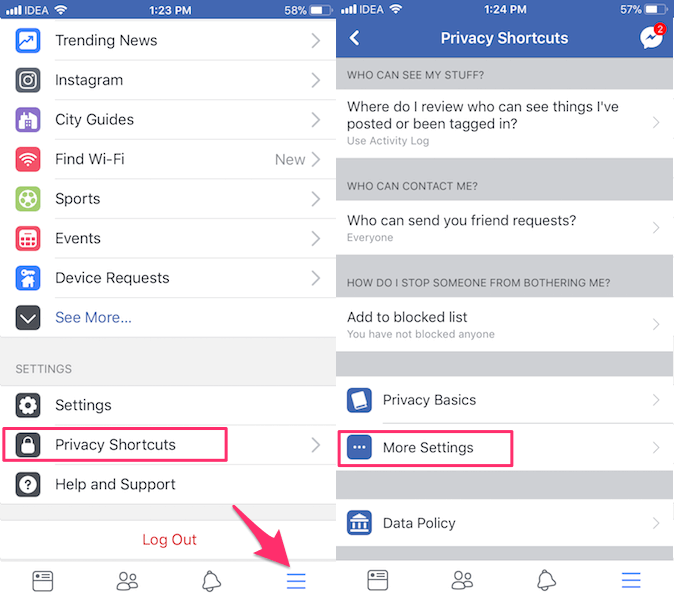 Step 2: Once you’re into the Menu section, select Privacy Shortcuts in the Settings section. Step 3: Choose More Settings under Privacy Shortcuts. Step 4: Here, you will come across Face Recognition option. Simply tap it. Step 5: Tap the question on that screen and then finally select No. In case you have changed your mind, you can always turn on the face recognition back from the same place both on the website as well as the app.